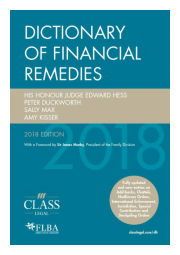 Over 70 expert practice notes extracted from the Dictionary of Financial Remedies 2018 available to all Hub members. A reminder that Hub members have access to the full text of the Dictionary of Financial Remedies on the Family Law Hub. The text is presented as separate practice notes, each one of which set out the essential law, key cases and important practice points for the topic concerned. They are the distillation of the wisdom and experience of the book's authors, HHJ Edward Hess, Peter Duckworth and Sally Max of 29 Bedford Row, and Amy Kisser of QEB. You will need to log on as a member to read them but as an example you can see the practice note on Joinder of Third for free. To join (for £295 a year) or to find out more, call Lisa at Class Legal on 01652 652222 or email info@classlegal.com. Of course you can also buy the book direct from Class Legal here if you prefer to read the printed page and want to slip it in your briefcase for court.